You may or may not have seen on my Facebook page about my run-in with a young guy wearing a One Direction t-shirt telling me I need to control my kid. Woah wait a minute.... I'm sorry, did I just say he was wearing a One Direction t-shirt?? Yes. Aged around early/mid twenties... and wearing a One Direction t-shirt. tutt tutt. Any respect for this young whipper-snapper went right out the door before he even opened his mouth to abuse me and my 'kid'. His mother would not have been proud. But maybe she, too, has a One Direction t-shirt. Maybe she gave him the t-shirt and he was wearing it because it was a gift from his darling Mummy. 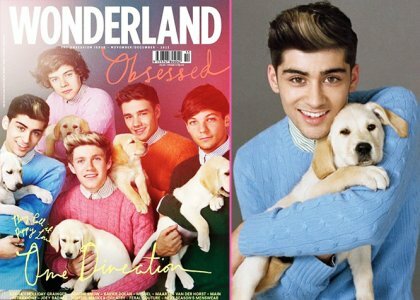 Yeah sure One Direction have photos of themselves cuddling cute little puppies, trying on their own puppy-dog eyes for size, their boyish good looks melting even the strongest of hearts. But I'm not fooled. No sir-eee. This heart of mine remains defiantly un-melted. I am sure if any of these 1D boys were to come across this frazzled mother in the street whose young (but seriously cute) child was having a melt-down outside his front gate, he too would probably have mouthed off at my obvious inability to 'control' my 'kid', while checking to ensure this minor altercation has not had a negative impact on his perfectly quaffed hair. I think the ill-feelings I have towards young whipper-snapper man who verbally abused me in the street has inadvertently been directed at One Direction. I've never really liked them, only because they're a bit too cute for their own boots. But now I really don't like them. Oh yeah, and maybe it has something to do with the fact my husband gets to go to Portugal with them shortly on their tour. Without me. They definitely are not getting a Christmas Card from me this year. Oh dear. A bit of 1D angst aye?? They do have pretty hair..... makes up for their lack of depth. I can't stand 12year olds singing about love. You did well not to give him a meltdown of your own! !